A hot sauce focused restaurant, Hot Mama’s Canteen, just opened in Black Rock. Read more about it from The Buffalo News here. The Public House of Buffalo will open in the old Canvas space on Hertel. Much of the best food I eat in Buffalo does not come from a restaurant, but rather, is shared around the dining room table or backyard of a friend or family member’s home. Last Saturday, we enjoyed a BBQ at the home of our friends, Chrisi and Sean. Chrisi is a hostess with the mostest, whipping up side salads regularly mistaken for being from Wegmans and curating an amazing spread, complete with addictive BBQ sauces and decadent desserts. Sean is a master behind the smoker/grill. The meats he unveils get oohs and ahhs every time. The smoke ring on his pork tenderloins are envy-inducing. I’m always happy and full when I leave their parties! Ever have decent food on an airplane? It’s a question that fascinates me, because indeed I have when traveling on non-American flights. Ruth Reichl reviews Jet Blue’s Mint class, their new version of first class, with an emphasis on the food. Anyone else flown Mint yet? Chef Brad Rowell from Elm Street Bakery told me this place in Toronto is worth checking out, so now it’s on my list for our next visit. It’s also located on an infamous street for me, as it’s in the heart of my dad’s old stomping grounds when he was a late teen/early 20-something. Roy Choi opens a hotel in L.A. Can you imagine that food as room service? My husband and I have super cute neighbors. I was so excited when they moved in–“oooh, a young couple!” One of them, Colleen, has a secret talent I didn’t know about until recently: She knows how to make macarons and she has a book to help you learn! There are some amazing sneak preview recipes on her site, including the basics for making the “shells” (cookie part) and dark chocolate macaron filling. I will share another post soon when I begin experimenting with the book! T-meadow Farm has the best pork around. We’ve got a big piece of pork shoulder ready for cooking. We’re thinking something like this or this. Have any great pork shoulder recipes you can share? What a lovely, simple summer dessert when my raspberry bush is booming. Here’s a great read from New York Times reporter, Elaine Sciolino, “Ode to the Classic Bistro.” She even quotes one of my favorite Julia Childs lines: “The kind of food I fell in love with [was] not trendy, souped-up fantasies, just something very good to eat.” This is one way it can be tricky to declare the best restaurants in any city, but especially a place like Paris. 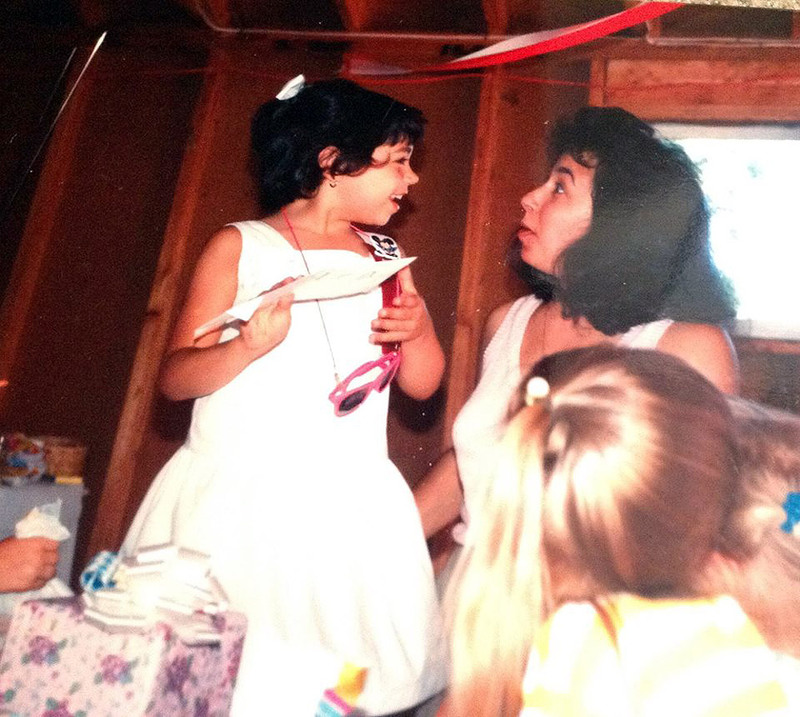 Lastly, it’s my birthday as I’m writing this, and I must say, my mom threw the best little kid birthday parties ever. The food, the games, the freedom to run around in the backyard on a warm June day–all perfection. Here’s an awesome #tbt photo she found and posted yesterday in honor of my 30th birthday. For the record, my mom is an incredible hostess to this day, whipping up spectacular spreads with prized ingredients and seemingly ordinary pantry items alike, making you feel like you’re a part of the family and there’s nowhere else you should be, and never minding a spill or broken dish. We should all take cues from her when entertaining (and cooking, baking, parenting and more).